Go back in time to the Sixties. The Police Action in Korea was over and the Vietnam Conflict was going full bore. Riots raged in the streets of many major U.S. cities, for one reason or another. Political agendas were being pushed by every group that thought they had the solution for everybody else. People believed anything was possible, even while poverty dragged at the lower classes. Change was blowing in the wind but still had a long ways to go. Now find your way to Harlem, above 110th Street, in Manhattan. This is no longer the glitz, glamour and jazz culture of the Roaring Twenties Harlem when cash and booze flowed freely. This is the afterwards Harlem of decaying tenant buildings, corrupt officials, hard to get money and the erection of instant slums. Booze still flowed in bars, after hours joints and house rent parties, but now weed and H had been added to fuel the mixture. Crime ran rampant and violence became an occupational hazard. In the environment of Harlem Precinct, only a certain breed of cop could enforce the law. Into this stewpot of pimps, prostitutes, weed heads, junkies, con men, gangsters, numbers bankers, thieves, muggers, and killers, author Chester Himes created two police detectives to keep law and order. The citizens of Harlem nicknamed them Coffin Ed and Grave Digger. They were there to protect the common people, the working stiff, the unwary, the naive square. Yet most times, Ed and Digger found it was all they could do to keep the lid on the city's garbage can. The car scarcely made a sound; for all its dilapidated appearance the motor was ticking almost silently. It passed along practically unseen, like a ghostly vehicle floating in the dark, its occupants invisible. Coffin Ed was defiant. "Who's beefing?" "The Acme Company's lawyers. They cried murder, brutality, anarchy, and everything else you can think of. They've filed charges with the police board of inquiry..."
"What the old man say?" "Said he'd look into it..."
"...The Coroner's report says the victim was killed where he lay. But nobody saw him arrive. Nobody remembers exactly when Chink Charley left the flat. Nobody knows when Dulcy Perry left. Nobody knows for certain if Reverend Short even fell out of the goddamned window. Do you believe that Digger?" The soft coughing sound of the silenced derringer was lost in the heavy booming blast of the shotgun. In his panic, Uncle Saint had squeezed the triggers of both barrels. The gunman's face disappeared and his thick heavy body was knocked over backward from the impact of the 12-gauge shells. Assistant DA Lawrence studied Jackson covertly, pretending he was reading his notes. He had heard of gullible people like Jackson, but he had never seen one in the flesh before. There was a turning of locks and a drawing of bolts, and the door opened outward. Casper Holmes was back in the hospital. His mouth and eyes were bandaged; he could not see nor talk. There were tubes up his nostrils, and he had been given enough morphine to knock out a junkie. But he was still conscious and alert. There was nothing wrong with his ears and he could write blind. 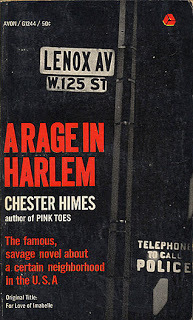 Chester Himes was born in 1909 to middle class parents, served time in Ohio for robbery, took up writing while in prison, moved to France to find a better life, won France's La Grand Prix du Roman Policier award for the best detective novel of 1957 (first in his Harlem detectives series), has his original manuscripts in the Yale University Library, and later died in Spain. Three of his detective novels were made into movies, titled: A Rage in Harlem (For Love of Imabelle), Cotton Comes to Harlem and Come Back Charleston Blue (The Heat's On).